Description: President Ford examines documents related to potential Vice Presidential nominees in the office of his Counsellor, Robert T. Hartmann. August 15, 1974. Description: President Ford takes a call after delivering his Address on the Economy to a Joint Session of Congress. Oval Office. October 8, 1974. Description: President Ford and his golden retriever, Liberty, in the Oval Office. November 7, 1974. 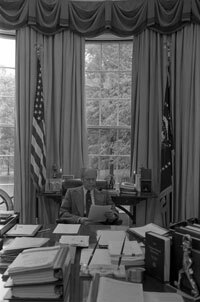 Description: President Ford at his Oval Office desk. March 25, 1975. Description: President Ford in the Oval Office. March 25, 1975. Description: President Ford signs his Crime Message to Congress. June 19, 1975. Description: President Ford studies a speech during a meeting with his editorial staff. Oval Office . May 1, 1976. Description: President Ford at work in the Oval Office. August 12, 1976. Description: President Ford departs the Oval Office for an event at the National War College. January 18, 1977.